Predictably, the number of hits on my blog were lessened compared to the first two days. These are rough estimates which are not dependent on any statistics. Even with the low quantity of any interactions, I’m still continuing the promised daily posts for today. Without them, my blog credibility may plunge. And when promises are developed then they must be upheld. Addendum to yesterday’s post: Remember the section about the explanation of the dreaded ARC’s. Well, I decided to email Orbit books about the possibility of reviewing some of their new releases. With trepidation, I wrote a lengthy explanation that concerned my ability to help promote their titles to a certain market. Once, they see today’s very late post for another publisher’s book, they may be dissuaded from offering anything. Why does the thought of reading Brent Week’s books cause me to act insanely and unpredictably moronic? Once upon a time, I was emailed a proposition about reviewing a certain “World of Warcraft,” title. Based upon my blog’s low number of watchers and exposure, I was taken aback that someone would be convinced I would exponentially increase their sale numbers with one of my more bizarre reviews. At the time, I was terribly deluded by the reality that there were hardly any publisher requests or inquiries. Therefore, I blindly accepted their terms and thought I would be wholly enraptured with a World of Warcraft novel. Two weeks later or earlier, I cannot remember the exacts. I began paging through the novel with apprehension now that my excitement and anticipation about publisher copies have quelled. Since, who before them would ever have the audacity to send “Fantastyfreak,” a copy for review. And surprisingly or not surprisingly, I struggled to read the book, mostly on the basis that my interests were far from the realm of World of Warcraft. Writing skill wise, the writer himself definitely has skills when trying to adapt mythology from a prodigious video game to a readable novel. The novel itself was readable and could be clearly understood by any level of readers who happen also to be WOW fans. Though my interest waned immediately when starting the novel due to being steeped with unfamiliar terms from a video game I have never played. Some of my dedicated readers ask: Does the book pique your interest in the game? Not exactly, I’ve never had a fondness for MMO’s and by result, I can appear to be someone whose relatively close minded about the workings of such games. In actuality, the only RPG game, I would greatly cherish novels from would be the universe of Dragon Age. Within the last two years, Dragon Age was the only exceptional RPG that was able to hold my attention and create in me an undying obsession. Basically, the book did not hold my attention mostly because of the book’s subject matter. Knowing this before accepting the terms of Galley books, I could have averted this disastrously late review. In some ways though, I have learned a lesson and that revolves around thinking every video game related fiction novel contains abysmal writing. Truthfully, this book definitely presents some tactful writing in certain sequences. 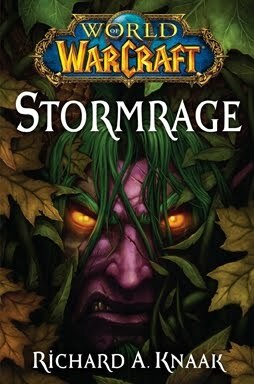 Though the writing would not be graded as something that is neither fantastic or evocative because it’s plainly a novel that provides general entertainment for World of Warcraft Readers. Readers, outside of the World of Warcraft realm, will struggle futilely to understand segments of the story. Various parts will fail to hold their attention only because they have had no previous interests in that particular game. World of Warcraft gamers on the other hand will be delighted to find novels which are skillfully written and provide some more information about their beloved universe. Essentially, the book itself was meant for World of Warcraft gamers, those who are fervid fans of the series. For everyone else, you might run the chance of enjoying the novel or you might be disinterested in it due to it’s World of Warcraft related content. Note to Publisher: I apologize for this extremely late review. In my defense, I did happen to have excessive amounts of college work during the course of the last few months. Please know, that I am working effortlessly to plan my book reviews better in order to balance novel writing, homework, and book reviewing. For other publishers, please do not be frightened by the above story in either this post or the earlier post. I am dedicating more time to this blog, during the course of this summer. And for these reasons, reviews will definitely surface this summer since I have a large span of time to include hours to review books.